The Engagement Events committee recently hosted the third Thirsty Thursday of the 2017-2018 NYJL year, “Hello, My Name is Community”. 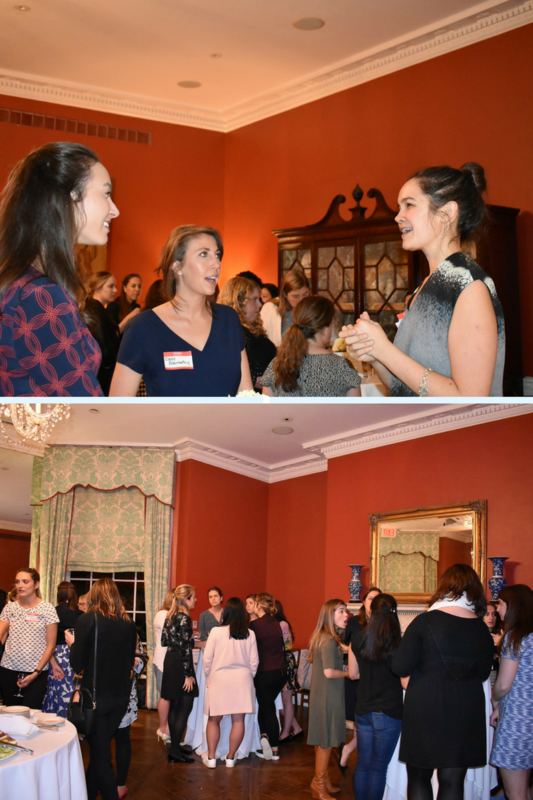 Active members and provisionals mingled in the Pine Room and Harriman Room, enjoying sliders, crudités, and pigs-in-a-blanket on behalf of the Astor House. In advance of Provisional graduation and January placement, Provisionals and Transfers alike were able to learn more about community committees by speaking directly with co-chairs. Representatives from committees including Senior Friends, Artistic Journeys, and Crisis Intervention, explained the requirements of their committees and spoke to the meaningful work they bring to the city and beyond. All members of the NYJL community are invited to Thirsty Thursdays, a monthly free event held at the Astor House with a cash bar. Members are encouraged to check the internal calendar and weekly Friday Flashes to stay up-to-date with the Engagement Events schedule. Stop by in 2018 for a fun evening and meet new women at upcoming Thirsty Thursdays, including Bingo Night and Trivia Night! For the latest NYJL news subscribe to our newsfeed. Strengthening the families of the greater New York area. The New York Junior League is an organization of women committed to promoting volunteerism, developing the potential of women, and improving communities through the effective action and leadership of trained volunteers. Its purpose is exclusively educational and charitable. We believe that all women, children, and families should have equal opportunity, the resources to unlock their potential, and the structures to support them. Our commitment to diversity and inclusion at the New York Junior League. We welcome all women who value our mission. We are committed to inclusive environments of diverse individuals, organizations, and communities.